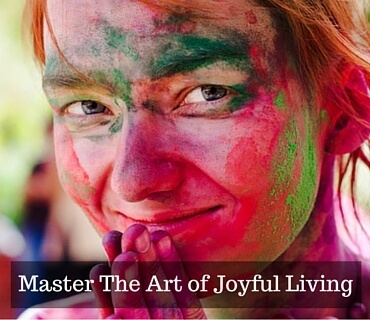 One of most rewarding things any of us can do to live a happier, healthier and more fulfilling life is to master the art of joyful living. Too many of us these days are moving too fast through life to really enjoy it. So much so, that by the end of the day, even though we may be physically wrecked, it’s still hard to unwind and get a good nights rest. So What Is Plain And Joyful Living? Well, one of the keys obviously has to do with slowing down. I’ve found out in my own life and after working with thousands of people that almost always it’s the simple things in life that have the biggest impact. Think about the last time you felt really happy and content. What was it that caused you to feel that way? I’d be willing to bet money that it was a moment when life suddenly felt simple. Just like when dark clouds part in the sky and the sun shines through and we instantly feel happier, it’s the same when we get a break from the busy mind. Really what we are looking for is a way out of our head because it’s the mind that gets all wound up in knots because of being constantly bombarded both from the outside and the inside. It’s the moment our head clears is the moment that life gets simple and thats when we feel happy. It’s almost impossible to feel happy when we are living 24/7 in our heads because the mind moves from one thing to the next so quickly. And a great deal of this mental energy is focused on problems, struggles, not to mention trying to process any doubts and fears, all of which creates tension in our body. In this video You’ll find some really simple ways to help quiet the busy mind as well as bring more joy into your everyday work and personal lives. It’s actually a lot easier than you might think as it’s just a matter of how you focus the mind to get more of what you want. Apart from learning how to be happy anytime and anywhere you choose, you’ll also discover how to train the mind to focus on joy and to use your imagination to turn any negative into a positive. How did you go? I hope that this shed some light on how you can now start to have more joy in your life by focusing on everyday situations that can be used to re-train the mind to become a beacon for good in your life.